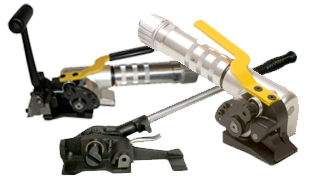 Products | American-Zyker Tool Repair, Inc.
Manual sealers —Come in different styles and depending on the application, there are front or side action sealers available. Also, some applications may require the use of seals or may have a sealless application. In either case, a single or double/notch or crimp can be achieved. There are many models to choose from for use with steel or plastic strapping. Pneumatic Sealers — Pneumatic sealers come in two different styles depending on a light or heavy duty application and a piston grip or a diaphram type sealer. There is a style in either type to use seals or provide a sealless application. In either case, a single or double/notch or crimp can be achieved. 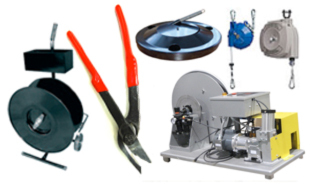 There are many models to choose from for use with steel or plastic strapping. Manual Tensioners — There are many types of manual tensioners. 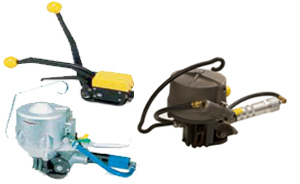 There are rack and pinion, feedwheel, push type and windlass. Each of these different styles are for various applications and are also available to work with steel or plastic strap. Pneumatic Tensioners — The pneumatic tensioners are available in the same type models, excluding the rack and pinion type. The pneumatic tensioners are designed to pull more pounds of tension and are generally used for heavier type of applications. Manual Combinations — Manual combination tools are available to use with and without seals and also provide notch/crimp type finishes. 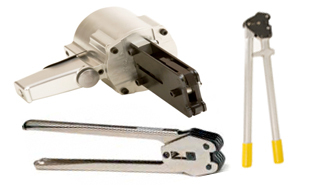 These tools are designed to provide tensioning and sealing all in one application and are available to use with steel or plastic strapping. Pneumatic Combinations — Pneumatic combination tools operate the same as manual combination tools except they operate with air pressure and require frl’s (filter, regulator, lubricators) for proper operation and maintenance. These tools are designed to work in heavier duty type applications.